Defense for Children International-Palestine (DCI-P) is a Palestinian NGO that claims to promote Palestinian children’s rights. However, many current and former officials, employees, and board members have links to the Popular Front for the Liberation of Palestine (PFLP) – designated as a terrorist organization by the US, EU, Canada, and Israel. DCI-P seeks to convince government officials, UN bodies, and the general public that Israel is systematically abusing Palestinian children. This campaign, known as “No Way to Treat a Child,” provides false and inaccurate information regarding Palestinian minors and their interaction with Israeli legal and security frameworks. DCI-P receives funding from UNICEF-oPt – UNICEF’s branch in Israel, the West Bank, and Gaza – and serves as an NGO “implementing partner” on various UNICEF projects. 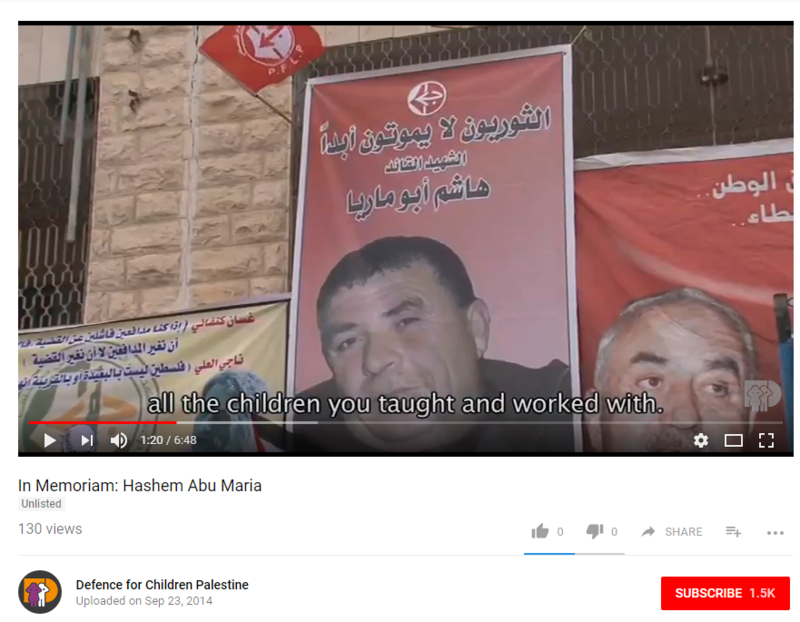 DCI-P is also member of UNICEF’s child protection Working Group, ostensibly charged with monitoring and reporting on violations against Palestinian children (see NGO Monitor’s report “UNICEF and its NGO Working Group”). In addition to funding from UNICEF, DCI-P has also received support from the Human Rights and International Humanitarian Law Secretariat – which was a joint NGO funding mechanism of the governments of Sweden, Switzerland, Denmark, and the Netherlands. The relationship between the self-proclaimed children’s rights NGO DCI-P and the PFLP terrorist organization documented in this memo demonstrates that the NGO fails to meet UNICEF and UN guidelines of partners being “neutral, impartial, and independent from all parties to the conflict.” The NGO’s terror affiliation is also antithetical to human rights norms and principles. Given these issues, DCI-P is an inappropriate partner and should thus be removed from the UNICEF-oPt Working Group. DCI-P previously directed donors wishing to make contributions in US dollars to a Citi Bank account in New York (account number 36371743), as well as to an Arab Bank account in Ramallah. Additionally, DCI-P encouraged its supporters to contribute through the donor-advised fund, CAF America- located in Alexandria, Virginia. On June 26, 2018, UK Lawyers for Israel (UKLFI) announced that after presenting evidence of the close ties between DCI-P and the PFLP to Citibank and Arab Bank PLC, “these banks no longer provide banking services to the terror linked NGO.” As a result, DCI-P no longer directs its supporters to make donations through these institutions. Global Giving, a US-based crowdfunding resource, also removed DCI-P from its website. 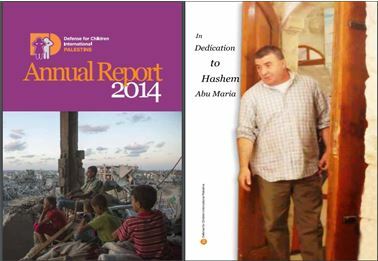 According to DCI-P, Hashem Abu Maria “served as the coordinator of DCI-Palestine’s community mobilization unit, promoting constructive child participation throughout the Occupied Palestinian Territory” where he “focused on Palestinian teens monitoring and documenting child rights violations in Hebron.” In July 2014, Abu Maria was killed during a violent confrontation in Beit Ummar. Following his death, he was hailed by the PFLP as a “leader,” which issued an official mourning announcement. 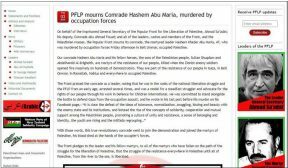 The PFLP also quoted a post from Abu Maria’s Facebook “It is clear the defeat of the ideas of tolerance, normalization…snuggling, kissing and beauty with the enemy state and its institutions, and instead the rise of the concepts of solidarity, cooperation and mutual support among the Palestinian people, promoting a culture of unity and resistance, a sense of belonging and identity…the youth are rising and the Intifada regrouping…” (emphasis added). On September 23, 2014, DCI-P uploaded a video (see Appendix II) of a memorial service for Abu Maria, featuring a speech by DCI-P General Director, Rifat Odeh Kassis. 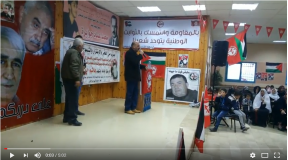 The courtyard where the memorial service took place was decorated with PFLP flags, posters, and pictures of prominent PFLP figures, such as founder George Habash and former leader Ahmed Sa’adat. Nearly all of the audience is dressed in PFLP apparel. 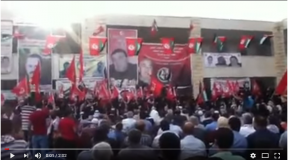 Another video of the memorial service shows posters of Abu Maria featuring the PFLP emblem and of Abu Maria with the DCI-P logo. DCI-P dedicated its 2014 annual report to Abu Maria (see Appendix II). 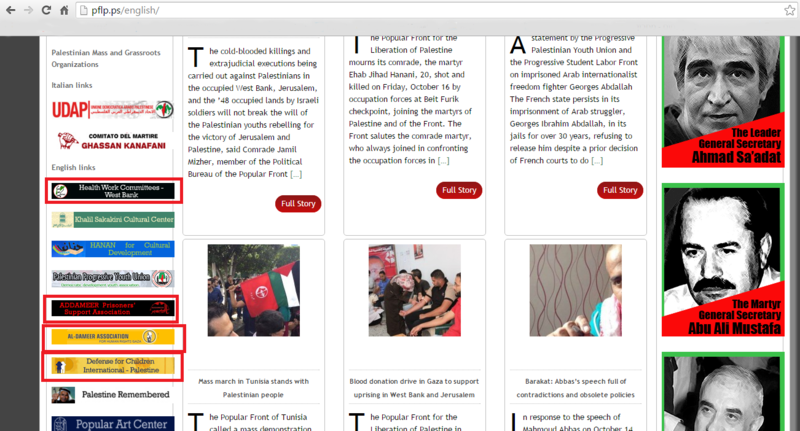 The event featured PFLP paraphernalia and individuals clad in military garb – some of whom appear to be children. Nasser Ibrahim is the President of DCI-P’s General Assembly – one of the group’s governing bodies – and previously served several terms on DCI-P’s board. 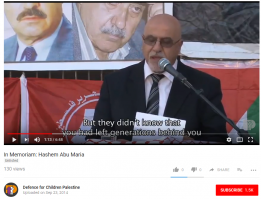 Ibrahim is the former editor of El Hadaf– the PFLP’s weekly publication. 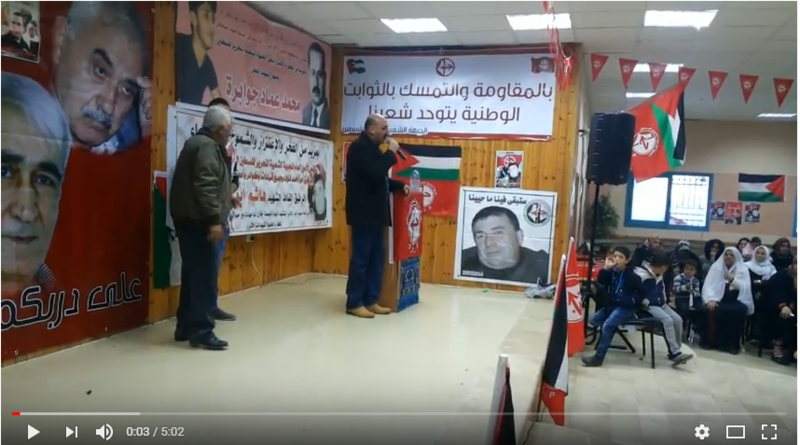 On May 1, 2014, the PFLP unveiled a mural “developed by writer and journalist Nassar Ibrahim,” honoring PFLP founder George Habash. Several PFLP members attended and spoke at the event. “The balance of power to the ground will not be changed– only by resistance, not by negotiation… I am not saying that I am against the negotiation but the negotiation is not the tool to achieve the right it is a result of our resistance. “The Palestinian resistance movement has therefore concluded that every checkpoint, every soldier and every settler are legitimate targets in the struggle for freedom and independence, thus rendering all theories and strategies of supremacy irrelevant. In essence then, everything becomes a target: Jerusalem, Haifa, Hadera, Tel Aviv, Ashkelon, the settlements, the checkpoints, the military installations and even the Israeli Ministry of Defense” (page 94). “No Palestinian accepts that the political parties that have struggled over the last fifty years should be regarded as ‘terrorist organizations,’ simply because their cause of liberation is anathema to the United States and its stepchild, Israel” (page 117) . A February 2018 Ma’an article identifies Samer Ajaj as the coordinator of DCI-P’s Community Empowerment Unit. He previously ran DCI-P’s office in Nablus. 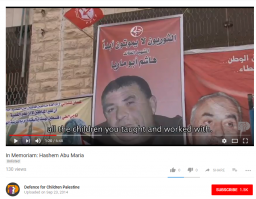 In 2012, Ajaj appears to have run for elected office in Nablus as a member of a list jointly controlled by the PFLP and another Palestinian organization. Mary Rock has been a DCI-P board member since 2014. 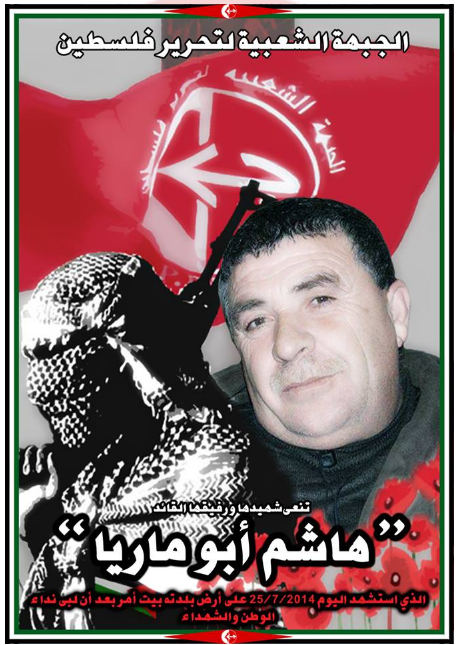 Rock was a PFLP candidate for the Palestinian Legislative Council in the 2006 elections. Attended a 2012 PFLP event honoring former Bethlehem mayor Victor Batarseh. Mahmoud Jiddah served as a DCI-P board member from at least 2012 through 2016. A May 13, 2017 picture taken at a meeting of the DCI-P General Assembly shows Jiddah standing next to General Assembly President Nassar Ibrahim, indicating his ongoing affiliation with DCI-P.
Jiddah was imprisoned by Israel for 17 years for carrying out grenade attacks against Israeli civilians in Jerusalem in 1968. According to news reports, following a 2016 meeting with Jiddah, Didier Ortiz, then a Green Party candidate for the Fort Lauderdale City Council, posted an Instagram photo of Jiddah citing the latter’s PFLP affiliation. Hassan Abdel Jawad has been a DCI-P board member since at least 2012. Appears to have spoken on behalf of the PFLP at a 2012 event organized by the group, honoring former Bethlehem mayor Victor Batarseh. Abdel Jawad appears to have been a PFLP candidate for the Palestinian Legislative Council in 2006. Shawan Jabarin is a former DCI-P board member. 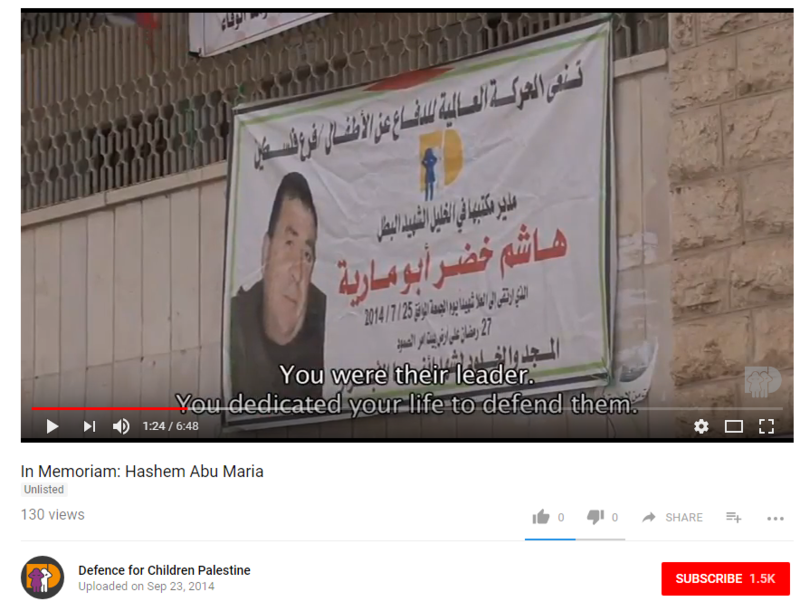 Nasser previously served as Executive Director of the Health Work Committees (HWC), an organization banned in 2015 by Israel for involvement in terrorism. In 2009, HWC’s Nidal Center was closed by Israel because of its ties to the PFLP. Nasser co-wrote The Palestinian Intifada: Cry Freedom, a book that praises the Palestinian terror campaign of the early 2000s (see section on Nassar Ibrahim above). Sahar Francis is a former DCI-P board member. 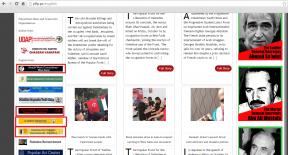 Francis is the director of the Palestinian NGO Addameer – an affiliate of the PFLP. Fatima Daana has been a member of DCI-P’s board since 2016. From 2014-2016, she served as the group’s treasurer. Daana is the widow of Raed Nazzal, the former commander of the PFLP’s armed wing (the Abu Ali Mustafa Brigades) in Qalqilya. Nazzal was responsible for several terrorist attacks and was killed in 2002 in a shootout with IDF forces. 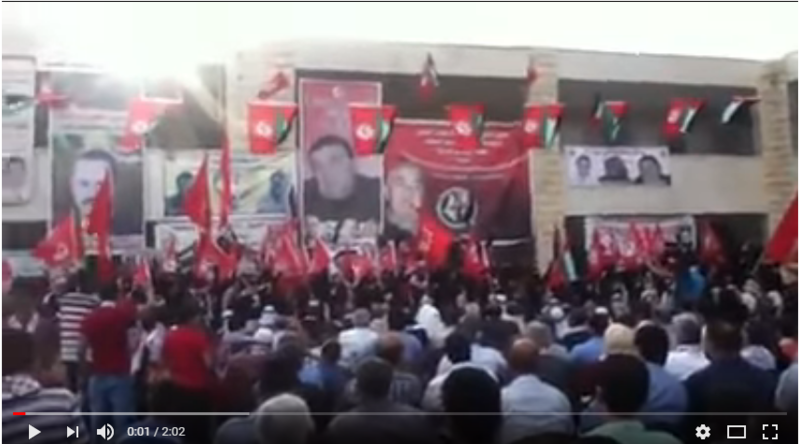 Screenshot of a PFLP memorial event, commemorating Hashem Abu Maria (Uploaded to YouTube by “عميد بريغيث”, December 4, 2014).